Photo: New America Media. Reyna Wences' & Tania Unzueta's "I'm queer & I'm undocumented" and Rigo Padilla's "I'm undocumented" declarations sent powerful waves through Netroots Nation 2011. Apply for a scholarship to attend Netroots Nation 2012 (click here). Netroots Nation 2012 will be taking place in Providence, Rhode Island, from June 7th-10th. The first round of selections will end on March 21st! (there are at a least a couple of rounds of selections). “I’m queer and I’m undocumented.” Those were the most powerful words I have ever seen a Latino youth say in front of hundreds of people. What was most remarkable was that many in the crowd had never seen a group of Latino youth speak so bluntly about either their immigration status or their sexual orientation. The Latino youth that were up on stage making such bold statements were the recipients of the Freedom from Fear Award Rigo Padilla, Reyna Wences, and Tania Unzueta of Chicago’s Immigrant Youth Justice League. The crowd burst into applause and as a Latino and an immigrant rights activist, my heart just burst with pride. I can only compare the kind of elation that swept over me at that moment to the kind of feeling I felt when the massive immigrant rights marches first burst onto the national scene. The feeling was the same – a sense of powerful unity that broke down through the shadows that for so long we have been condemned to live under in our communities. The place was the Netroots Nation conference of 2011 in Minneapolis, which I was able to attend for the first time thanks to a partnership between Democracy for America and the immigrant rights organization America’s Voice. I was the recipient of one of their scholarships, which funded my trip to attend the conference. As I attended the various panels during the convention, I ran into many online activists that I had only had the opportunity to talk with through twitter, through e-mail or through phone but never in person. It was actually at one of the panels that I met Rigo Padilla. This was before he received the award and little did I know that I would see him later up on stage in front of everyone. For this reason, during the ceremony I felt an even stronger connection to the people up on stage. I could identify with Rigo in ways that frankly I had not been able to identify with other progressive activists. Although the crowd at Netroots Nation is a progressive one, historically speaking diversity had ben lacking in years past. That is, until Democracy for America in partnership with America’s Voice stepped in. There are hundreds of activists like me that have not yet made it to the Netroots Nation convention. It is imperative that more people of color participate, and that more people of all walks of life bring their voices and ideas to this massive meeting of progressive minds. I have seen firsthand the powerful effect that it can have on the progressive movement. Thanks to the scholarship I received, I was able to attend and even host a panel on how environmental issues affect Latinos, being that another one of my big passions besides immigration is environmental protection. My panel was titled “Beyond Environmental Justice” and afterwards I had people from big name progressive organizations coming up to me to hear more of what I had to say. It was an incredible experience that I will never forget. I even got to meet and talk to some of the role models that I have from afar admired for a number of years such as Markos Moulitsas of Daily Kos and Congressman Luis Gutierrez. More importantly, I will never forget making so many friends; activists just like me. People like Rigo, Reyna, Tania, and others. I shared laughs, hugs, handshakes, and discussed strategy and exchanged experiences with many of my fellow progressive brothers and sisters. I can’t wait for this year’s Netroots Nation. I hope that you consider joining in this amazing convention too. If you are Latino, Asian, or any other immigrant rights online progressive activist, be sure to apply for the scholarship so you can attend this year! 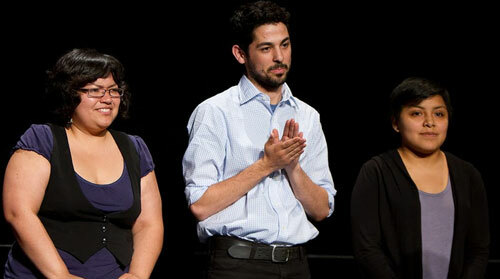 Read more on Rigo, Reyna, and Tania on this New America Media’s post. This entry was posted in Featured Story, PER and tagged America's Voice Online, convention, Netroots Nation, panelists, progressive bloggers, scholarship, workshops. Bookmark the permalink.